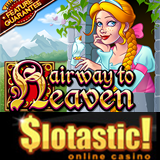 I think the best thing about Slotastic Casino’s new Hairway to Heaven slots game is the Feature Guarantee system that some of the latest games from RTG have. But it's also a fanciful fairy tale extravaganza with not one but three free-spin features. You should try it! Slotastic is currently offering players a 100% deposit bonus (up to $400) to get you started. Hairway to Heaven is 5 reel, 50 pay-line slots game that pays out up to 5000 times the bet. Favorite childhood stories come alive as a beautiful princess lets down her golden hair on its prize-doubling expanding Wild. The Scatter symbol, which triggers free spins, is her charming prince. Like several other RTG slots at Slotastic, Hairway to Heaven offers the patented Feature Guarantee system that triggers one of the game’s three free spin features if they haven’t been randomly triggered within 125 spins. The powerful Hairway to Heaven Feature gives up to twenty free games, with an expanded Wild held on the middle reel and an increasing prize multiplier per spin. Slotastic.com has a fantastic choice of slots games, but it also offers a complete selection of casino games provided by Real Time Gaming (RTG), including Blackjack, Baccarat, Craps and Roulette. Players from around the world are welcome at Slotastic.